One of the best ways for your restaurant clients to maintain their long-term success is to keep their customers engaged and satisfied. From offering quality food and service to providing real-time responses to their questions and concerns, those activities affect their bottom lines. Utilizing the right technologies helps them accomplish that mission. According to the National Restaurant Association, more than 80% of restaurants are investing in innovation and offering online ordering, Wi-Fi and accepting mobile payment. The phone system is an especially critical part of that transformation. From the sales department to reservations and order taking, phones are typically at the epicenter of a lot of frustration for everyone – including the callers. With so many eateries to choose from, customers expect quick responses, short wait times and a quality experience – which also includes their phone conversations. That’s where mobile and web-based productivity tools come in. 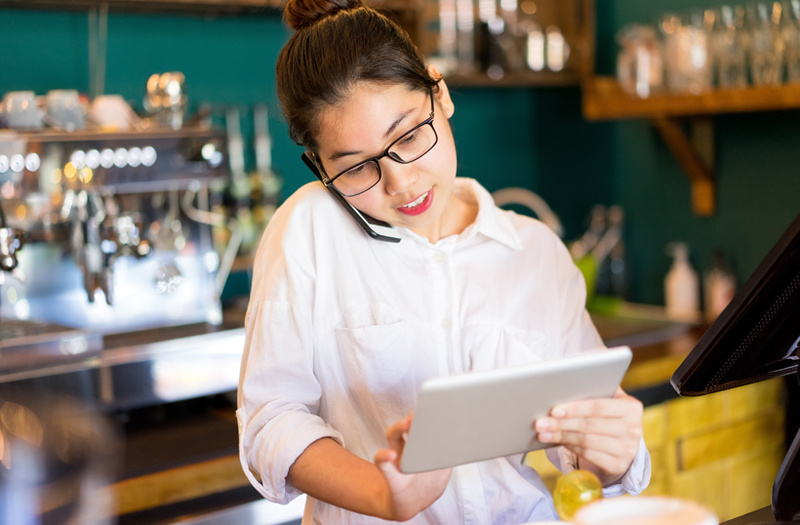 These solutions allow restauranteurs to gain new efficiencies in their operations, including customer communications, while keeping their costs down. Consider offering your restaurant clients a hosted VoIP option to keep their operations running smoothly and while saving them a significant amount of money. Here are a few ways you can leverage voice technologies to boost their businesses’ profits. Instead of rushing between customers onsite and those on the phone, your clients’ employees can rest easier knowing that the proper VoIP system allows calls to be transferred to offsite employees or to other restaurants in the chain. This option is perfect for businesses with multiple locations in different time zones with varying peak hours. Improve productivity by reducing your client’s staffing requirements and employee turnover. Restaurants with less stressful working conditions typically enjoy higher worker retention. The last thing your food service clients need is to have their internet go down. Hosted VoIP offers them a backup plan, redirecting orders and reservations calls to mobile phones or other locations. These solutions minimize the possibility of your customers losing sales due to uncontrollable circumstances. No matter how many employees or locations your restaurant clients may have, answering every call can be difficult. Voice solutions can allow workers to accept orders and reservations via email messages when they are not able to answer the phone. Wouldn’t your customers appreciate a calling plan based on the quantity of phones actually in use rather than the total number of devices in their restaurant? Keep your client’s bottom line in check with ConnectMeVoice’s Call Path Pricing. This flexible hosted VoIP plan even allows multiple stores to use the same system, including extension-to-extension dialing and call forward options. Most managers and owners aren’t in their stores 24/7, so wouldn’t it make sense to offer up mobile applications that allow them to work and manage their systems remotely? For example, the ConnectMeVoice mobile app gives administrators the ability to make call routing changes or go into emergency mode to carry out business continuity plans, as well as other activities. Whether your clients have a single location or several, the phone system they use can significantly affect their operations. Hosted VoIP applications will help ensure your clients enjoy the benefits of an automated and efficient workplace while paying less each month. According to the National Restaurant Association, more than 80% of owners say technology helps increase store sales, improves productivity, and gives their businesses a competitive edge. Why not partner with a company with a history of helping its partners deliver hosted VoIP in this market, including regional chains and larger franchises? Learn more about working with ConnectMeVoice by contacting our team at (855) 743-0557 or visiting our partner page.